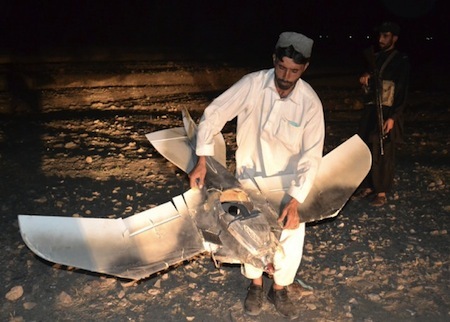 Take a look at this amazing drone that crashed last week in Pakistan. Is it a birdlike surveillance drone? If so, whose is it? A spokesman for Pakistan’s paramilitary force says a suspected U.S. surveillance drone has crashed in a military area near the Afghan border. Pakistani paramilitary spokesman Saeed Ahmed says the small aircraft was equipped with cameras and other equipment but no weapons and crashed Thursday in the border town of Chaman in southwest Pakistan. 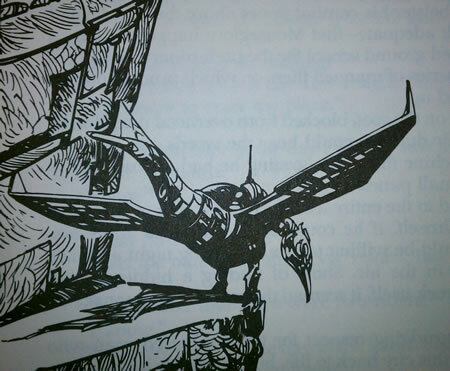 Compare this real-life drone to the biomimetic tracer-bird from Roger Zelazny's excellent 1980 novel Changeling, illustrated by Esteban Maroto. "He saw the blue-bellied, gray-backed thing upon the sill overhead. It was turned as if watching them. A portion of its front end caught the sunlight and cast it down toward them... The tracer-bird followed their every step, hung upon their words..."